In the early 1850′s, a small group of German Jewish families settled in the city of Hamilton. In 1853, they banded together to form the Hebrew Benevolent Society Anshe-Sholom of Hamilton. Religious services began in 1856 and in the next year, a half-acre plot was purchased as a cemetery site. 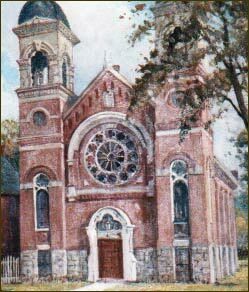 On May 5, 1863, a “Body Corporate and Politic under the name of the Jewish Congregation Anshe-Sholom of Hamilton” was formed listing 19 founding members. Early meetings were held in members’ homes, with religious services, at first, largely restricted to the High Holy days. In 1866, a room was rented above a leather goods shop in downtown Hamilton; this was the first formal synagogue location for Temple Anshe Sholom. Less than 20 years later, a site was chosen and the necessary funds were raised to construct a synagogue. Often referred to as the Hughson Street Temple, this building was dedicated in 1882. It served as the congregation’s home for almost 70 years. Edmund Scheuer, who arrived in Hamilton in 1871, served as President of Anshe Sholom for thirteen years from 1873 to 1886. Scheuer was the founder and first teacher of the religious school. He was an early proponent of interfaith understanding, a value and tradition that Anshe Sholom carries forward to the present day. The congregation pioneered in introducing English into the service, both in prayer and in the sermons, which had previously been given in German. Women no longer sat in a separate gallery; families sat together in pews. Music was introduced, both instrumental and vocal. In 1870, the Deborah Ladies’ Aid Society (later Deborah Sisterhood) was founded, being the first group of Jewish women organized for charitable purposes in all of Canada. Sisterhood has always been a vital part of Temple Anshe Sholom, involved in numerous humanitarian, educational, charitable and social projects. The great wave of immigration that swept into Canada in the late 19th and early 20th centuries brought many families, mainly Orthodox, to the community. During this period, men and women from Anshe Sholom were instrumental in founding such vital Jewish organizations as the B’nai Brith, Council of Jewish Organizations, Jewish Social Services and the Council of Jewish Women. Temple Anshe Sholom Moves to West Hamilton: After the Second World War, Temple Anshe Sholom became the first synagogue in Hamilton to make the post-war move westward. 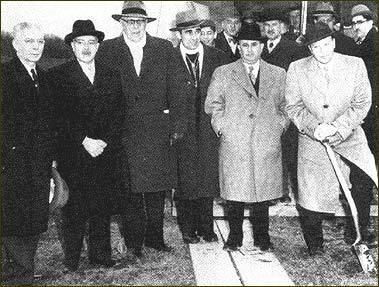 On April 15, 1951, the sod was turned for the new building and in June of 1952, a dedication weekend saw the scrolls ceremoniously installed in the Ark. Rabbi Maurice N. Eisendrath was on hand to preach the Dedication Sermon. Thirteen years later, the addition that houses the present Reiss-Frank Auditorium, Religious School classrooms, library, youth lounge and offices was erected, more than doubling the size of the building on its present site. Throughout the years, Anshe Sholom has been blessed with capable and dedicated rabbinical leadership. Records of the congregation show that the following have served as spiritual leaders: Wolf Landau, Herman Birkenthal, Joseph Friedlander, Jacob Minkin, Julius Berger, Iser Freund, Arthur A. Feldman, Arthur Lebowitz, Emil Fackenheim, Luitpold Wallach, Bernard Baskin, Irwin Zeplowitz, Phil Cohen and our current rabbi, Jordan D. Cohen (Anshe Sholom’s first Canadian born Rabbi), who began his service to this congregation on January 1, 2007. The late Rabbi Feldman, who served as rabbi from 1926 to 1941, was a gentle and kind leader, who led his congregation throughout the difficult days of the depression and the rise of Hitler. He had a doctorate in philosophy from Vienna, and a profound understanding of Freudian psychology. Outspoken in his hatred of sham, bigotry and hypocrisy, Rabbi Feldman was a pioneer in interfaith activities and left an indelible imprint on the thinking of his congregation. Rabbi Emil Fackenheim served the congregation from 1944 to 1949. The depth of his insight and the unique character of his spiritual message as well as his valuable work in the community won him a lasting place in the hearts of his congregants. During his incumbency, the first of the Interfaith Institutes was held at Anshe Sholom, with well-known Rabbis and church leaders on hand. Rabbi Fackenheim was a Professor of Philosophy at the University of Toronto, was also associated with the Hebrew University of Jerusalem and exercised worldwide influence as a leader of Jewish thought. 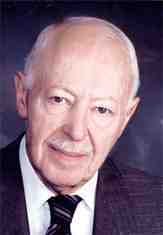 Rabbi Bernard Baskin served as rabbi from 1949 to 1989. Under his wise and devoted leadership, the congregation grew from 100 to 475 families, attracting many members who had previously been unaffiliated. The congregation was extremely active and a wide variety of spiritual, educational, social and cultural events and programmes flourished. Family life cycle events and religious school enrolment increased dramatically. The congregation worshiped on the traditional side of Reform. Rabbi Baskin has served on and held office with countless local, regional and national organizations, both Jewish and non-Jewish, and built a genuine sense of goodwill, respect and understanding within our Jewish community and between the Jewish and general communities. Among the many honours he has been awarded are a Doctor of Laws degree from McMaster University and a Doctor of Divinity degree from HUC-JIR. A highly respected and distinguished speaker, writer, teacher and leader, we are privileged that Rabbi Baskin, now our Rabbi Emeritus, continues to play an active role in our congregation and our community. With the strong foundation established by Rabbi Baskin, Rabbi Irwin Zeplowitz arrived in l989. 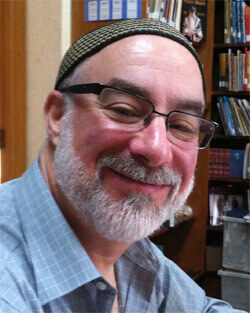 The congregation was fortunate to enjoy this dynamic and caring Rabbi. His family-based innovations enabled the synagogue to grow in a number of ways, ranging from enriching educational opportunities and congregational dinners to involvement in mitzvah projects and challenging issues of the day. He encouraged the congregation to be more inclusive and promoted greater participation of young people in congregational life. He played an important role in the decision to hire a full-time educator in 1992 and worked with our educators to revitalize our school. Deeply committed to social action and interfaith understanding, Rabbi Zeplowitz also strengthened our ties to the people and land of Israel. He introduced liturgical and ritual changes, including increased use of Hebrew, and innovations to make services, life cycle events and ritual observance more engaging and meaningful for people of all ages and backgrounds. He combined a respect for the past with optimism for the future. At this time, Temple Anshe Sholom is traditional yet innovative in its worship and ritual observance. Under the dedicated leadership of Rabbi Jordan Cohen, Cantor and Program Director Paula Baruch and Educator Dora-Ann Cohen Ellison, the congregation is inclusive and embraces diversity. Its core values include education, social justice, egalitarianism, creative expression, congregational participation in prayer and leadership, strong identification with Israel and dynamic, relevant spirituality. There are joyful Sabbath, Festival and Holy Day services, vibrant religious education programs for students from Kindergarten through High School, popular youth groups and camp programs, family retreats, seniors programs, and a multitude of adult learning opportunities. The Temple building also serves as home to the Temple Playhouse Multicultural Enrichment School and the Kehila Jewish Community Day School, and hosts many community organizations such as a Storytellers Group, The Shalom Community Teaching Garden, The Asper Foundation Human Rights and Holocaust Studies Program, The Mahjong Club, The Hamilton & Area Jewish Genealogical Society, various community meetings and gatherings and several youth arts and activities programs and summer camps. The members of the Anshe Sholom congregation are actively involved in all Jewish communal activities and are committed to every aspect of the life of the greater Hamilton community. At Temple Anshe Sholom, we strive to create a place for everyone and foster warm and supportive relationships. We celebrated our 165th anniversary in 2015 and are proud to be Canada’s oldest Reform congregation. We look ahead with confidence and hope to many additional years of service to God and the community in a land of freedom, peace and opportunity.